We host Ask APPPA, a unique Q&A call on the third Tuesday of each month. 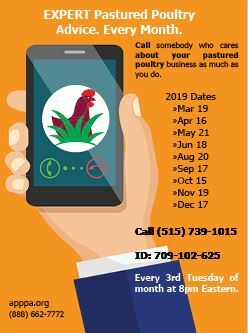 The call is open to anyone regardless of membership status, and it's an opportunity for you to ask questions to a panel of pastured poultry experts. Mark your calendar with a recurring appointment on the third Tuesday of each month at 8pm EST. Dial (515) 604-9094 and enter Access Code 709-102-625. It only lasts for one hour, so make sure you understand the time zones.